Will You Still Love Me When I am 500? I have been amazed. Humbled even. At times, dumbstruck ... but also exhilarated. I have watched from time to time as my Technorati ranking inches higher and the number of links increase. Early on, Ann Handley gave me the opportunity to contribute to MarketingProfs which made me write a bio, upload a photo and start using my own name rather than the mysterious "Servant of Chaos". I have been mentioned as hovering somewhere on the edge of Mack Collier's Top 25 Marketing Blogs (wow, cool). A little while ago Liz Strauss awarded me an SOB, and Todd And recently decided to expand (and automate) his Power 150 to include non-US sites such as Russell's blog, Brand Tarot, Adliterate and Servant of Chaos. While I am pleased to be mentioned alongside all these great blogs it still amazes me that through blogging it is possible to reach out, engage and become friends with people from all over the world. As David Armano recently said to me "My blog life is far more glamourous than my real life" -- me too! I checked Technorati today and found that I am close to having 500 inbound blog links. This seems to me to be a milestone of some kind. Much of this, I feel, is a result of the phenomenal Z-list ... and may evaporate in the next 90-180 days, but it is nice while it lasts! Having said that, one of the most fascinating things that can be done is to follow the hypertext love back through the web. By doing this I have found some amazing and exciting blogs and "met" a wide range of people from Europe to India, across the US and even here in Australia (just check my blogroll -- I do almost every day). I am sure that a big blog party has to be on the cards soon! So, I was thinking about what it means to turn 500, and wondering how best to celebrate. It is clear that there are many people who read my posts but don't leave comments -- and probably have been doing so for some time. So ... I am thinking I will take a leaf out of Pauly's book and open up the chaos to a guest blogger. All you got to do is be the 500th inbound blog link -- then come back here and leave me a comment. Scary? Maybe not for you, but probably for me! Oh, and if you want to be a Hollywood Star, get your own here. Well we already knew you were an A-Lister, now Technorati's about to verify it as well, congrats! Congratulations, man! Hitting the big time! Damn. Can't think of any way to hack the system and create 30-50 links to your blog without a ridiculous amount of effort. hmmmph. What fun! Go for it! Okay it's late and truth be told, I am not that bright. But...if you are looking for the 500th blog to link to you, it will have to be one that has never linked to you before, right? Right now, you have 1098 links from 495 blogs. So, if I linked to this story -- I'd advance the 1098 to 1099, but I would not budge the 495 because I have already linked to you. Right? So all your regulars should just chill and wait to help you celebrate the milestone? Hey Drew ... not so dense ... you've got it! If I take on Jackie and Ben's 1% rule there has to be some dedicated readers out there who have yet to link in or even comment. Should be interesting to see who turns up! I have a feeling it may just end up being another making money blog from the dark side of the Z-list -- and will be only a link not a comment. If that is the case then I might just throw it open to a comment lottery. I do actually love the idea of guest bloggers ... seems like fun! The average blog has exactly one regular reader (that isn't the author or their mother), and lasts three months. Congratulations on your longevity! And thank you for being part of an incredible opportunity to connect with the world. "If we all knew what we all knew..."
You listed all those accolades but you forgot to mention that I sent you an "Arsemail." sniff, sniff. well done, gavin. this is the right reward for this great blog. Yay! Clinking a virtual glass of champagne in your honor. :)You deserve it big time. As if you didn't have enough to do without keeping track of of these numbers and links! Congrats, Gavin. Wow, you're like a BLOGGING ROCKSTAR now! I already link to you, so I'm just commenting to say that you're living proof that hard work and generosity go very far in the Land of Blogs. Well done. After your beautiful work to include the Z-list in Wikipedia, Gavin, you deserve this award. And when the Z-list was first out you were one of the first people to come and comment on my blog. I must confess I was afraid to visit the blog of someone who termed himself, "Servant of Chaos" because I feared what I would find. But I took the leap because you commented and love the "Chaos" I found. Made me remember that I cannot trust assumptions. But I love your blog and and visit because it's fun and uplifting. You are a star and deserve every acclaim you receive and more!! I do not know if my trackback to you worked. Hopefully one of my readers has already given you the link. Yes, we will still love you at 500. If I love you anymore than I do right now I think I'll be in trouble. I am so proud of you and, as I said over in Drew's corner, you set the model for this 'sphere. Every post you write gives to someone else...you're already #1 with me (and many, many others). Nicely done! 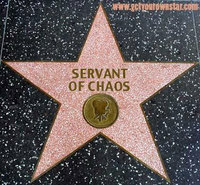 Servant of Chaos has been a source of inspiration for myself and countless others. Keep up the wonderful work here—you help set the bar for all of us. Way to go, Gavin, and thanks for the star tip!